Tooth Whitening – Dr. David R. Liebes, D.D.S. Whitening your teeth is the simplest of the ways to enhance your smile. Removing stain and lightening the enamel it is a non-invasive way to cosmetically change your appearance. There are several methods currently on the market. In office, custom tray at home, and strips are the three most popular. We highly recommend custom trays at home but also offer an in office option. Before whitening your teeth you should evaluate any existing restorations you might have. Tooth whitening is not permanent. A touch-up maybe needed every several years, and more often depending on you habits. 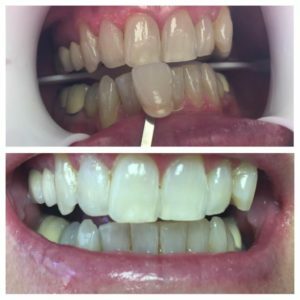 Lighten adjacent teeth before cosmetic enhancement. At home tooth whitening requires two visits to the office. At the first visit impressions will be taken in order to fabricate custom trays. These tray can be multiple times should touch up whitening be done in the future. Once the trays are ready you will come in for a second visit. We will make sure the trays fit comfortably and instructions on how to use the kits will be given. Sensitivity during whitening may be experienced and use of desensitizing toothpaste is recommended. This is only a transient sensitivity and will subside once whitening is completed.